Formulaic and predictable? Yes but so are many blockbluster films and even if you can guess the ending it can still be exciting to watch. The Flèche Wallonne has become a known quantity defined by its final climb, the infernally steep Mur de Huy. The Route: 204.5km and that wall. It remains a 200km warm up and then the world hill climb championships. After a start in Binche the race heads north-east for loops around to Huy. 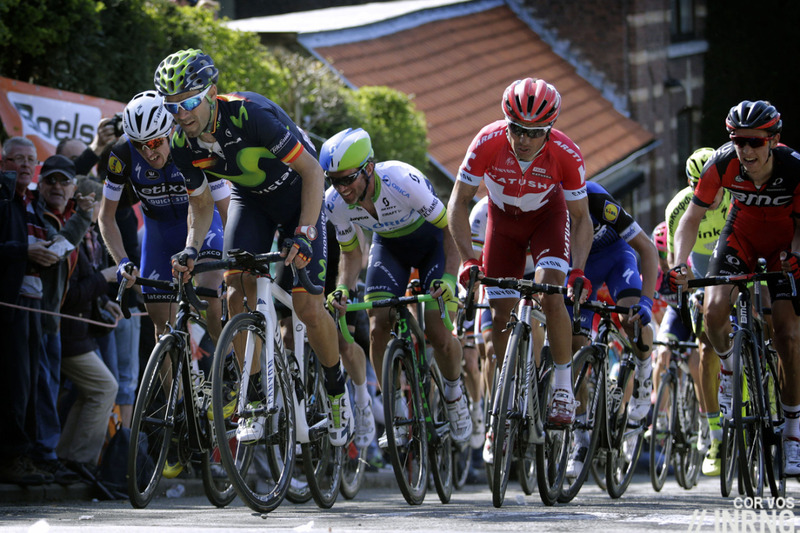 The Mur de Huy is tackled three times (58km to go, 29km to and the finish). When they go up with 29km to go watch to see who looks at ease and who looks flustered as these small clues often reveal what happens later. Crucially the section after the Mur runs south-east and it’s on a plateau which means it’s perpendicular to the forecast crosswind (see forecast below) and exposed to the wind. This could be an interesting section where weaker riders or sleepy teams could be eliminated. The Côte de Cherave is features again after its introduction in 2015. Just 5.5km from the finish, it’s 1.3km at 8% average but mostly over 10%. It’s steep, the kind where you see the gradient illustrated by the way each house is higher than the next. But it’s a wide, straight road so moves are easy to gauge. The Finish: 1.3km at 9.6%, the Mur de Huy doesn’t sound like much. But beware the average as this climb starts off slow when riders pass under the flamme rouge and then rises up. Take the inside line on one of the corners and the slope reaches 26% and if you have the luxury of choosing your line then it is only 19%… but longer. The road is very narrow so few get to pick their line. Riders use gears like 39×25 or even a 27. Once you reach the last 300m the gradient eases up and some have been known to deploy the big ring for the final sprint. The effort is huge and requires maximal effort but also supreme restraint, ideally you want to be the first to surge clear as the road levels out but to leave this effort as late as possible. It’s all about timing as to accelerate on the steep parts requires a big increase in force and if you launch too early and you will blow. But if you cannot follow the leaders then it’s unlikely you’ll make up for lost ground, this isn’t a climb to pace yourself Froome-style. Alejandro Valverde (Movistar) is the prime pick. He’s won it for the last three years in a row and returns in sizzling form hoping to win a fifth time. He has a good team to protect him including past winner Dani Moreno. A certainty? It’s doesn’t exist in cycling, it’s easy to be blocked by others on the climb and maybe he simply has an off day but given his record and form it’s hard to look past him especially since this edition is without past rivals like the retired Joaquim Rodriguez, the injured challenger Julian Alaphilippe or previous winner Philippe Gilbert. Dan Martin has finished 6th, 4th, 2nd and 3rd here and these results suggest a result is due. He’s excellent on steep finishes and has a good finishing kick. He’s taken a win already this season but his only result in the last month has been DNF in the Amstel meaning he’s picked on reputation. Petr Vakoč sometimes looks too heavy to feature here but he’s got several wins atop steep climbs and the story goes that his team asked him to do a one minute effort and they thought his powermeter was badly calibrated as the numbers looked too high, only it wasn’t as he’s that strong. Bob Jungels might prefer a long range attack. Sergio Henao (Team Sky) has been on the podium here before and showed what he can do in the Paris-Nice finish on the Mur de Fayence where he was the best of the rest behind Simon Yates’s attack. Team mate Michał Kwiatkowski rides and is in great form as his ride in the Amstel shows but is surely better suited to Sunday’s Liège-Bastogne-Liège rather than this uphill effort but maybe he’s tempted to take a long range risk? Michael Albasini isn’t a star pick but has a handy sprint and should be Orica-Scott’s best hope. He’s been on the podium before, is in form and in a race where experience counts for so much he could repeat another podium place if things go his way. Cannondale-Drapac have some strong cards to play. Michael “VO2 Max” Woods can climb with the best here but he needs to have practiced the climb and studied previous editions to learn the necessary pacing. Rigoberto Uran was close to a stage win in the Tour of the Basque Country and can sprint well out of a small group. Lotto-Soudal have several promising riders but as ever it reads like a cast of supporting actors rather than top bill riders. 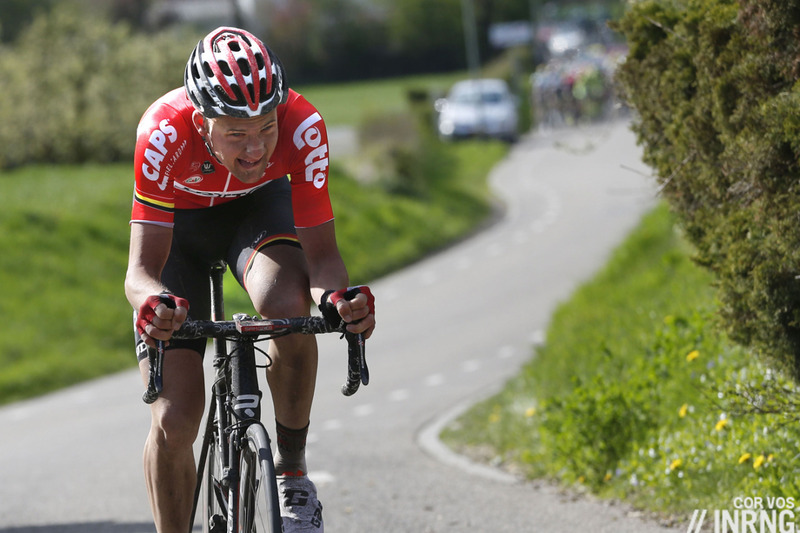 Jelle Vanendert has placed here before, Tim Wellens is in good shape and can try the sprint. But how do they win? Some will have to attack but no breakaway has worked in this race since 2003. Warren Barguil (Team Sunweb) was ninth last year despite the training crash. Now he’s in better shape but is still in that “promising” phase rather than delivering and this unique finish won’t give him many chances. UAE Emirates come with three options in Rui Costa, Diego Ulissi and Louis Meintjes all outside picks for the podium with the first two having the experience in this race. Ag2r La Mondiale are another team with a strong squad. Romain Bardet probably has his eyes on Liège-Bastogne-Liège, it’s too steep for Pierre Latour – 19th last year – so Alexis Vuillermoz would be their pick. Only he’s supposed to be targeting the Ardennes races after a promising sixth place here in 2015 but a car crash over winter has hampered his training and he’s only been back in action in recent weeks so he’s likely short of form. Finally Jarlinson Pantano is always exciting and seems to be even better at Trek-Segafredo. Weather: cool and cloudy with a top temperature of 8°C, a shock for many of the participants who have flown in from their training camps. It’ll be windy too with a 20km/h breeze from the NE gusting to 30km/h which could heat up the race. TV: local coverage on RTBF starts at 2.15pm Euro time with the finish forecast for 4.35pm. You might be tempted just to watch the finish but it’s worth watching them climb the Mur de Huy earlier on to spot who is doing what and they’ll go up it at around 3.50pm. It’s an ASO race and notionally available on the same channel you watch the Tour de France. If not there’s Eurosport… if not you’ll find streams via cyclingfans.com and steephill.tv. Women’s Race: Huy is not a scenic town but it’s worth visiting for the race because the Mur allows you to see the men’s race several times and the women’s race too, an estimated 15,000 people line the climb. Anna van der Breggen looks almost as certain Valverde given she’s won the two previous editions and just took the Amstel Gold Race leaving Kasia Niewiadoma, Ashleigh Moolman-Pasio, Annemiek van Vleuten, Lizzie Deignan and Pauline Ferrand-Prevot for the podium places. The finish is forecast for 2.05pm CET. I like Pantano for this time around. The route Suits him well and given that he wont have much game play later in the season is now the time for the domestiques. It’s a climb of experience so Henao probably has the better chances but Pantano would probably make a more popular winner. I think anyone other than Valverde would prove to be a very popular winner. As you so correctly point out, this race is settling into a predictable formula. Some of these older established races really do need to adjust their parcours to modern developments in the sport – roads, bikes and riders. I will watch in the forlorn hope that something exciting happens before the final kilometer. Races need to adapt to survive, ASO alone is no guarantee. It’s difficult to know what to do, ideally they’d have more climbs in the finish, eg do the Mur with 10km to go to split the bunch up, then another climb and then the Mur for the finish and this way you do away with the flatter approach roads. The Cherave climb is good as it provides some suspense instead of the high speed race along the Meuse but it’s almost too close to the finish to launch a move, attack and you can’t take enough of a lead to defend on the Mur. I agree with that. There are other very steep climbs in the vecinity of Huy. You can easily make a route with 3 steep climbs in the last 10k, then it may become different. Nice to see that others are also considering how some of the older races can change and adapt for the better, whilst at the same time retaining their unique identity. Maybe the starting point is to remove the Mur as the finishing climb, but include it in a new final circuit. I suppose the important question is what are the views and intentions of ASO. ASO have contracts with the local government, I’m not sure when Huy runs out but they’re linked to Ans so the Liège finish seems fixed for a year or more, the idea is one day to return to Liège and finish in town. Playing a bit of devil’s advocate, what’s wrong with 200km warm up and world steep short hill climbing championships? As a starter, it gives the race an identity. Yes it is probably very boring for seasoned cycling race viewers, but it would be good experience for general public on the hill side to see the guys dual it out (as well as to see them in relative slow motion two times before). The huge concentration of people on the Huy also means it is a good place to put up some billboards and get some advertisement money. If the money is so good that it makes the event self sustain or even brings revenue for the organiser all the better. Agreed. They could have a look at the Giro dell’Emilia to copy a formula which can still grant an uphill sprint, but might be open to mid-distance group attacks, too (like when Quintana won), or at least show a significant selection before that last sprint. I mean, if they wanted to preserve the possibility of the trademark final climbing apnoea. Vuillermoz looked very good on Arrate, finishing 12th at 22s behind the leaders, same time as an in-form De la Cruz. Let’s hope he can show. He, like many ex MTB riders, seem to hit the road with a flying start only to plateau or go stale, only a few really break through to big results, eg Evans or Péraud. Sagan was only briefly doing MTB races, no? Fuglsang is a good example, a brilliant start as a neo-pro but he never got the results that were promised by this start even if he remains at a high level. Physiologically a lot of ex XC riders seem to have great power for short 5-10-20 minute efforts but lose some of this as they do more road events, gradually turning into diesels. A generalisation of course rather than a law but one to look for. We’ll see what Diego Rosa, Ondrej Cink and others do. Aren’t a lot of those riders who dabbled in all forms of cycling as kids before specialising on the road, rather than MTBers who crossed over as adults? Best to just congratulate Valverde now and move on. The last few years this race has become genuinely boring, a parade to the Mur de Huy for a “who can climb the fastest” contest. Valverde can. Open and shut case. Please, anyone but Valverde, sick of seeing him win already! Yes, Valverde, such a bad guy and because he mysteriously is the only one who profits from former doping, he wins this much. Sure. While Greg van Avermaet is such a good guy (oh, wait, wasn’t it van Avermaet, whose own federation wanted him banned 2 years for doping…) and Gilbert, so brilliant this year (wait, with his almost 35 years he wins two monuments after years of nothing, one with a 55km break…. ) and Boonen, wow, such a gentleman (wait, didn’t he take illegal drugs, not only once, but twice and don’t we know from many cases, that this is often a sign of other things in the peloton, like addiction to sleeping pills and other medications….). Luckily Valverde stays enjoying his life to the fullest, stays winning, stays having fun with his team, stays having peace and a good working relationship with Quintana and stays being liked by many of his peers judging from what they say and doesn’t care a tiny bit about the haters, which seems to drive them even more crazy and bitter. Yeah! It is so boring and annoying: If people would focus on the racing and not so much on the tabloid and scandal part of cycling, cycling wouldn’t have such a bad name and wouldn’t’ attract ever more people who in reality like a juicy story and bashing riders much more than a race. If something wrong or bad happens, we can focus on it, this is only common sense, but actively seeking always the negative only is destructive. Your comment reads a bit like “If only people wouldn’t concentrate on the murders that murderers do you might see them for the really nice people they are underneath.” Some people may choose to turn the blind eye but they are merely another part of the problem not the solution. Perhaps you should focus on who the murderers are, if you want to apply such a metaphor. Calm down. No-one mentioned doping, former of otherwise, or any “juicy stories”. We just don’t like him and want someone else to win. formulaic and predictable? Quite possibly, but won’t stop me from tuning in, always gonna hang my coat on Dan Martin’s chair, to dust all comers in the World championships of hill climbs. I’d like to see Si Yates riding, this would be right in his wheelhouse, just racing on the Mur and getting a feel for it, would be a great learning curve. I get, Orica’s eggs all in the Albi basket. True but races need more than the diehards to stay relevant. Less races, smaller & more teams gets my vote. Wish cycling calendar was more geared to allowing new fans to enjoy. The historic messiness is quaint but redundant. Please some billionaire come a buy all of cycling and re-organise so that each event feels special rather than constant random races few if anyone really care about. And that’s coming from a life long fan who watches even The Tour of Turkey. Well, the former, that is, what you wish for is a perfect description of what “historic” cycling is (or *was* before the obsessive pursuit of supposed change – read *easy short-term money* – seen in the last couple of decades or so). Whereas the latter is what we’re going to get if some Bernie shows up to destroy the sport in a few years like he did with F1. Historic cycling means that each event feels special because *it is* special and more often than not “the one of its kind”. And when you say “few if anyone” I guess you mean the millions of people actually watching races despite a crazy lack of TV consistence through countries and events. Fans who don’t understand why cycling’s biggest fans love the Ardennes and Northern Classics maybe will never really understand these races. These are the real races that people care about… Just add up the fans watching on TV or internet or in person. These are even bigger than the Tour sometimes. For example, you could hardly say that Valverde’s Palmares doesn’t match or surpass Froome. Tom Boonen too, much better palmares and clearly not a Tour GC contender. I agree 100%. The final climb of the Mur always gets me very excited. I only tune with about 8km to go to be honest. OTOH – a peleton chasing Tim Wellens (or someone else) starting the climb with a margin of 30 seconds could be just as thrilling, or maybe even more tense. You need it at least this long at this level for a one-day race. The “warm up” is really a war of attrition that weeds out lesser riders so that only the absolute strongest are there in the finale. Being a one-day race, it is explosive enough as is whereas a GT needs shorter stages because everybody is toast before that day’s stage begins. I am also OK with this race, as the Mur de Huy has really become a legendary place for cycling. I am happy they changed the route in AGR though. And I still think they should do the same for liège. I agree – this race has its own (formulaic, admittedly) character – it’s LBL they need to change. Hopefully, AGR showed the way. As a 45 year old I am seriously thinking of getting my elite level race licence sorted. After all, with all these old guys kicking the behinds of the 27 to 33 year olds it is clear that the new ‘natural’ prime age in our sport has shot up to the late 30’s to mid 40’s. I like this race, and may watch it depending on who wins, I would like to see some supposed prime cycling aged rider win. At work on a Wednesday. It is recording on my Mag Box, will make the decision to watch when I get home. Haha, fair enough. Did you watch it? Sadly, once I heard a veteran level rider managed to power away from all those younger guys in their prime I decided that catching up on a few episodes of Family Guy was a more enjoyable way to insult my intelligence. Surely, all you had to do was watch the last 5 minutes of the race without looking at the winner first? Can’t see the logic in not doing so – it’s only a quarter of an episode of Family Guy. At what age did Valverde become implausibly old in your eyes and does this rule apply to others? OTOH, Kwiatkowski and Dan Martin, the only vaguely plausible contenders, might indeed have won, if they only had performed at the level they showed in 2013 or 2014. Perhaps they don’t like Cherave. Why aren’t your “younger guys in their prime” doing just the same as Evans, Gilbert or Purito Rodríguez did? Those riders performed regularly better than Valverde virtually *ever* did, and, as a consequence, placed their wheels ahead of Valverde’s (like, dunno, Cunego or Samuel Sánchez). I guess you never suspected that maybe we’re just having a “weaker” generation, and/or less in form riders. Well before doping became technically as relevant as in recent years, classy older riders could win over younger ones if you had a weaker generation. Even more so in a race like this one where we can check the decisive performance in quantitative terms. On the mur, I don’t see who can beat Valverde. Dan Martin, Kwiato possibly. Vakoç? Really difficult to find somebody able to win. My hope is in a coalition between Kwiato and Wellens for a long range move..? A pity Gilbert does not ride. Apparently he is quite badly injured, he had to stay in the hospital and must pass for the Giro too. Formulaic and Predictable? its not Valverde’s fault no one can beat him. Great race and will be tuning in to every second of it. The race I saw only Bob Jungels tried to beat him. Do you think that Jungles was trying to win or was playing a great role for the team(? ), meaning Martin could just mark Valverde as Movistar chased. Tro-Bro Léon was yet another race (another example was the last stage of the 2016 Paris-Nice, but there are many) where the camera motorbike rode consistently behind the two leaders, but in front of the chasing peloton. Obviously, you can’t film the peloton from the back – you see nothing. Ergo, isn’t it equally obvious that in the interests of fairness you film the lead riders from the front too? Fantastic to see the Armée guy win – and what a celebration! – would have been a disgrace had the peloton caught them. Wrong page – but equally applicable to today’s race: De Marchi and Jungels faced precisely the same situation. Is this not apparent to those in charge? Dan Martin never seems to learn in this race: there’s one tactic – sit next to Valverde. Martin was miles back – why? Everyone knows where you have to be at the start of the climb. And then almost everyone waited for Valverde – why? There must be only a handful of riders who could possibly beat him in the sprint. Would give us something to watch as well. When you see that Teuns is 3rd -a promising rider for sure, but no results yet at this level-, you can only get to the conclusion that the only one able to beat Valverde in this kind of finish is Dan Martin. Problem is that he sat too far indeed – unforgivable. The blight of the WT points chase has been seldomly so obvious as in yesterday’s chase of Bob Jungels. Luckily Jungels and De Marchi had teammates on the podium and not the chasing teams. Talking of young guys, the 20 old Gaudu on 9th rode a very brave race and event attacked at one point in the Mur. agree 100% on Tro Bro, I nearly stopped watching when it looked like the moto-driven peloton were going to make the catch as I couldn’t bear to witness the injustice! Thankfully it was a terrific win for the rider who’d made and driven the break. ZZZZZZZZ. Even those whose hearts sing for a Valverde victory must admit this wasn’t a thrilling spectacle, just compare it to Amstel Gold last Sunday. Nice try by Jungles to liven things up, but was never going to be anything other than an uphill sprint. This must be the most formulaic race on the calendar, and I know, it’s part of the character and history, but still, what a snoozer. Dan Martin had his usual characteristic fast finish, however with 250m to go he should have been alongside Valverde. Of course its all Valverde’s fault again!! Just like Kelly winning PN 7 times in a row! didn’t they reverse the route on the 8th year. For fear of sounding like an armchair racer: Martin follows Valverde’s pace nicely, just too bad his starting point is 4 rows of riders back with 250m to go. Kind of takes the suspense out of that duel. But then again, it seems like Valverde has his own rhythm which noone seems to be able to follow – and for every win people try even harder to do it, only to be forced into the red. Maybe Martin is just too nice, doesn’t use his elbows enough and the others are too respectful of Valverde. I thought it was quite telling how they just let him dictate the pace up the climb. I was thinking that if Martin had Gilbert to help him keep in front and pace the lower slopes of the climb then Valverde could’ve been beaten. Lots of conjecture of course but seeing how fast Martin came back from 10th or so to second in those last few 100m, dodging some ‘parcheggio’ riders in the proces. Well that was quite impressive. Valverde definitely has the faster pickup but, come on, this is 4 times in a row now. What happened to anticipating the move and trying something different? They all just paced it up the Mur, all afraid to lose by going too early. My only praise goes to Bob Jungels. At least he tried to win. The rest had already settled for the lesser places. What did the others do to beat Valverde in 2013? He finished 7th, Moreno followed Gilbert’s attack and won, but that’s all I can recall. Was that a year when Valverde was merely in good form and not in top form – or was there a tactical lesson to be learned that for some reason hasn’t been applied during the last four years? Betancur attacked at the foot of the wall, it looked like he could stay away, hence Gilbert was forced to open the gas sooner than probably intended, with 300 mts. to go: then, Dani Moreno attacked with perfect timing 175 mts. away from the line. However, Valverde stayed too far behind the front all the time, on the dreaded “S curve” he was in 20th position more or less and he looks like he was still in 13th-14th position when the very steepest part ends, some 150 mts. to the line (half of them still uphill, half of them essentially flat). Sidenote: a 23 years old Sagan was 6th in that precise moment, but he just had finished the gas and started looking over his shoulder… losing six positions before crossing the line; and he had been 2nd just behind Gilbert when Dani Moreno jumped clear. 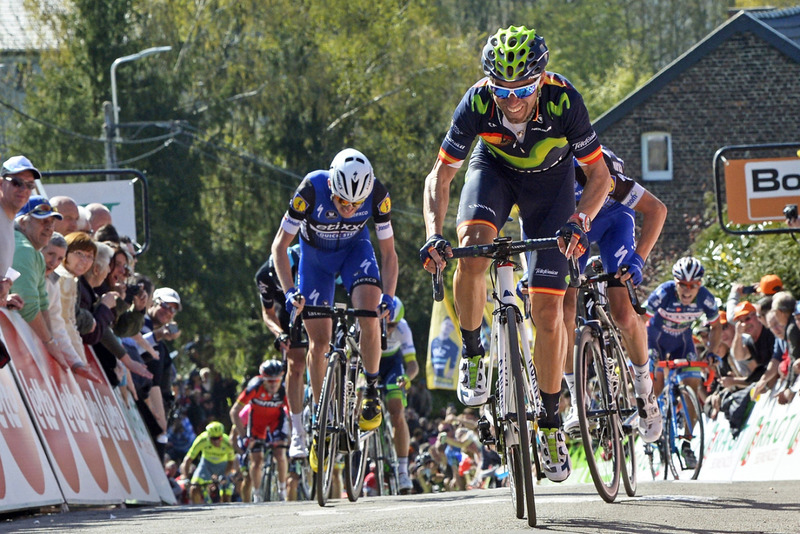 Valverde jumped ahead strongly in the very finale as he always does. Despite holding the time record, Valverde looks like he didn’t really loves to climb the wall in less than 2’50″… I’ll check, but I’d say that the only time in his career when he made it, it was precisely when he got the 2’41” record! Cherave slowed things down a bit on the wall in the last 3 years (or was it just the lesser quality of the pack? ): however, maybe that favours an older Valverde, too. Ok, guys, now you know it: it’s about making a proper rain dance or… just going a bit faster. With the 2014 exception, Valverde is being pretty much consistent throughout his performances. Tradition spladition – this race is dull as… and was full even before Valverde was unbeatable… love uphill sprinting but maybe just shorten it? What’s the problem of have one 100km race in the year? It’ll be great having it go mad from the first second. It’s not that it doesn’t go mad because it’s 200 kms long. If it was something like that, it could be 200 kms long and just go mad with 100 kms to go. Something we saw happening on even harder terrains like the Roubaix, the Lombardia or the Ronde. Which doesn’t mean that I wouldn’t like to see any change introduced – but I’d rather see meaningful ones. Just because Valverde won again doesn’t make it a boring race. Far from it, . . . exciting to the very end. Shows that Valverde’s still got some serious power in them 30-something legs of his. Purito used to have that same powerful uphill kick too. And as discussed here last week on The Inrng, no sooner had he won a record five times on the Mur, Valverde was asked what else he could do next–win this year’s World Championships? He took the question in stride, and answered that he’d like to win, but is no longer obsessed about winning it. He seems to be quite content and “placido” with himself at his age. That’s good to see. I fear that without Gilbert and Alaphilippe in the Quick Step team Valverde is going to walk another LBL as well. He needs to be taken out from range in a similar way to Sagan. He wont race aggressively so teams need to be firing riders away in the last 40km, but unfortunately Quick Step are down two options. Maybe we’ll have to rely on Lotto. In that sense Fleche is the perfect race for Valverde because it is probably the most defensive race of the year. I like the peculiar identity of the Flèche, yet I believe that some correction on the course might be introduced, essentially for the same reason which makes me think that some slight change could be useful for Milano-Sanremo. The problem is always how to keep alive the specific nature of the race (let’s say… even if it’s not an *original* nature but the result of the last three decades of racing, like in Sanremo or in the Flèche) while opening the sheer possibility of some different script for the finale. It’s not that I don’t like the breathtaking uphill sprint, I just consider it a flaw when a cycling race doesn’t offer *the slightest chance* for whomever should try a different approach, hence (among other things) restricting quite much the field of possible winners. Seven or eight uphill sprints every ten years would be enough to contest properly the World Championship of hill climbing, wouldn’t them? That’s why I think that some sort of intelligent engineering must be applied to the Flèche – it needs to be especially clever, since IMHO the finale on the wall should remain as it is. The mission is hard but not an impossible one: I cited the Giro dell’Emilia, but Paris-Tours offers another brilliant example of an apparently *closed* race which offers frequently a surprising script. People (especially people at ASO, where there’s a lack of great route designers) many times focus on the last 10-30-50 kms or so, but we could see here, in a graph (! ), the effect of Le Manie in Sanremo, and we could watch on TV the effect of the Muur in the Ronde, as well as the Valcava historically had a huge impact on the Lombardia, even when nothing especially apparent was happening there. I agree completely with the commenters above noting the lack of aggressivity by most rival teams: I praise Jungels, too, and blame the rest. Valverde had been pretty much isolated when Sky and Orica decided to do the work for him. And what’s the strategy behind Ag2R’s decision to place four riders in the first 30 places (both in couples, Bardet-Latour, 13th and 14th, plus Vuillermoz and Frank, 26th and 27th)? Do you really need *four* riders – in decent or good form – trying the same move on the same little climb, even more so when none of them is especially suited to that kind of effort? I might justify keeping two strong riders for the finale, in order to have one of them drive the other through the bunch *or* to launch one from “far” (600-800 mts. to go) as a tactical factor, but did the teams who brought a strong couple together to Huy even tried anything like that? Were *really* Sky or FDJ doing anything like that? A sprint is a sprint and he fastest man tend to win, but in flat sprint tactics are paramount, too, both during the sprints itself and the race as a whole: in the case of an uphill sprints things are different (a “train” makes less sense), but the general concept is the same – you can force an error from the strongest rider, put him in a complicated position or try to take advantage from superiority in numbers. So we’ve got an especially “closed” race (it’s like 15 years or so that it’s ending like this, you can’t explain that just with UCI points or Valverde’s skills); plus, a rider who’s both notably gifted in general terms *and* particularly fit for this setting, that’s pretty much undeniable (Zabel and the Sanremo come to mind); and, last but not least, a lack of serious competitors, firstly because we just don’t have many rider competing as good as it would be needed to push Valverde to the limit (Gilbert, Evans, Rebellin, Purito are just *way stronger* riders than Daniel Martin, Albasini or Henao, just look to the excellent results of Alaphilippe, who – albeit very strong – is still very young and far from mature), and, secondly, because the teams, instead of trying alternative stretegies because *they just don’t have* strong enough riders, go on hoping for an improbable miracle in the last 200 mts. Not much can be done by the organisers about the individual talent factor or the teams’ attitude, neither would it make much sense to force a course change because of the presence of an excelling rider: all the same, the route factor appears to be indipendent from the other two and might be used to produce change on the latter, too. – Could it be that they were trying to get as many points as possible in a race they thought they had no chance of winning? This is what a points system encourages – this is what happens if you reward people for coming 14th. No, the low part of the points’ curve is flat enough to prevent this extreme an attitude in one-day races. It might be worth being conservative only when you’re in top-ten zone, not for lesser placings (and from 16th to 20th it’s the same score, as from 21st to 30th!). I myself believe that the point system has been a factor in several occasions, and for other teams at the Flèche (especially since it’s so hard to know if you’ll actually need them or not at the end of the season: hence, you often go for them anyway). All the same, this wasn’t Ag2R’s case, IMHO. Placing just *one* rider in the 7th place (without anyone else scoring any point) would have been way better than four of them between 13th and 27th. Or you could achieve a better result getting a 10th and a 13th place with mere two riders scoring, totally spending the other couple in whatever creative action. The sheer loss of the worst placed two – let’s say, for example, attacking from far and thus supposedly arriving well behind the top 60 (sixty!) – is only as worth as a general 14th place, or the *difference* between an 8th and a 10th place (not much). It’s a bit different in the case of FDJ: if they had spent Molard from far, it would have been a significant loss in terms of points. With two men on the inner edge of the top-ten (8th and 9th), they got as many point as Albasini’s top 5 placing. Same *could* be said for Sky… if they needed to rack up points here and there. But they actually don’t – they need to get wins. In that sense, not playing the Kwiatkowski card from further out was a significant mistake, IMHO, although having both him and Henao in the top ten (not even podiuming!) meant scoring more points than 2nd-placed Martin. Yet, I don’t think that’s the way Sky is reasoning (or that’s what I hope), whereas I can understand that FDJ has such worries. Also note that launching K. along with Jungels would have allowed Sky to sit on the wheels and spare Rosa, while putting extra pressure on the isolated Valverde; the Italian might have worked as a gregario for Henao on the wall and still be able to collect a few more points in the process. I can justify Orica, who had to maximise the result of their very obvious main captain, Albasini. However, other teams were bordering nonsense with their passive attitude, for instance Bora, with 3 riders in the top-30 scoring less than a single man’s 10th place or than a combination of 13th and 14th place; or Lotto Soudal, with Wellens and Vanendert coming home hand in hand just 13″ behind Valverde (that is, they had acceptable form) and, together, scoring less than Izagirre’s 12th place. Same could be said about Cannondale, who could use Urán or Slagter before the finale, keeping Woods for the last climb. As you see, points don’t matter that much in these cases: I’d dare to say that they were relevant only in FDJ case, the rest was mere misjudging or losing attitude. Funny fact: *finally* we’ve got a race that the supposed-modernity gurus should just adore in order to make cycling *user-friendly* and oh-so-much TV-effective, like: you need to only watch the last 20′ or so (if you want to catch the details about occupying positions, guessing who’s feeling good, appreciate which teams are pulling etc.) – then, the final 5′ never fail to deliver explosive action. Many people, including several supporters of fast food cycling, are grumbling… World is strange, isn’t it? You’ll find them often complaining about long, unbearable hours of broadcast, just to disappear from the radars when the Ronde or the Roubaix show that, well, sometimes long hours of broadcast are just exciting all the way long (which is *not* the main reason because of which cycling race must remain long enough, but it’s a useful reminder, like the Giro stages often are, that good cycling can easily stay amazing for a full couple of hours or more – I’ll concede that Tourdefrancetarians with just the Tour and corresponding prep races on their menú might end up forgetting this simple reality, not totally their fault!). Watch the replay for Wednesday’s race and you wonder what would’ve happened if Dan Martin had been glued to Valverde’s wheel like he should’ve been… He started the final sprint so far back and overcame 20+ people to finish second. You feel like he was head and shoulders over the rest (other than Valverde) and could’ve really given Valverde a run for his money. Of course, Valverde free-wheeled over the line, but still, it would have been interesting if Dan Martin was positioned better. Obviously positioning is half of the game… but, still.